We are excited to be holding our San Antonio Institute at the Embassy Suites on the Riverwalk. After a day of fantastic professional development, thinking, working and fun it's time to step out onto the Riverwalk and explore. Ride a river taxi to tour the Riverwalk; you will probably see at least one Mariachi band. You'll also get an overview of many different restaurants, see beautiful architecture and learn more about San Antonio from the excellent boat captain/tour guide. Be sure to give him a well-deserved tip when you disembark! See our Things to See and Do and our San Antonio Foodie pages! View Embassy Suites Photo Gallery here. The Embassy Suites will be catering our events. We know that well-fed educators are happy learners! Please note that these menus are part of our philosophy of meeting the needs of The Whole Teacher. You will not find any cold boxed lunches or Styrofoam cups. Rather you will be served hot food, in elegant buffets! You will enjoy our complimentary . . .
Day 1 - MOVE IT, Math! Day 2 - MOVE IT, Math! Each of spacious, two-room suite provides plenty of space and a unique combination of comfort and convenience… with a private bedroom and a separate living room with a full-size sleeper sofa. All suites are fully equipped with a 32" flat screen television in each room, a refrigerator, microwave oven, coffee maker, two telephones, high-speed Internet access and a well-lit work table. Room service is also available with tantalizing options from light snacks to full course entrees. Many suites offer stunning river views, as well. 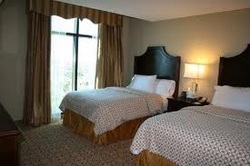 For reservations: (210) 226-9000 Check rates, availability & book your room online! NOTE: We do not reserve room blocks, so Reservations people will not know about the event. The Embassy Suites Riverwalk offers you a full American cooked-to-order hot breakfast each morning. Order an omelet any way you like it, filled with most anything you want. Don't want an omelet—no problem! We can do scrambled and over-easy, too! Our breakfast line also features hot and cold cereals, a variety of fresh fruits, bacon, sausage, pancakes and so much more. One thing for sure, you won't leave hungry! Take time for a great start to your day—enjoy Embassy Suites delicious cook-to-order breakfast! The nightly Manager's Reception features a wide choice of alcoholic and non-alcoholic refreshments and a variety of hors d'oeuvres to signal the end of your day and jump start your evening. Kick your shoes off and unwind in the lush, open-air atrium--a perfect place to plan your next day's adventures. Below you can see a map of the Riverwalk which displays hotels, restaurants and shopping. You can also go to this link to access and download specialty maps of the Riverwalk which are for Museums, Missions and Accessibility.